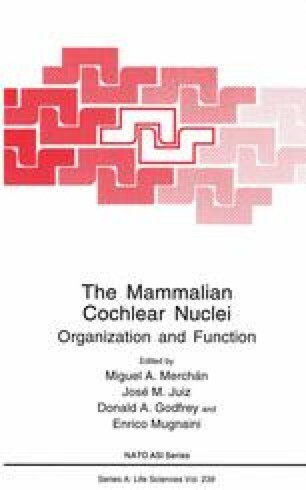 The cochlear nuclear complex (CoN) contains several populations of neurons that are highly diverse not only with respect to morphological features but also physiological responses to sound. With few exceptions, morphologically and functionally distinct cell types are differentially distributed in the anteroventral (AVCoN), posteroventral (PVCoN) and dorsal (DCoN) divisions of the CoN. With the advent of intracellular injection of tracers coupled with microelectrode recording, physiological response patterns can be more precisely correlated with individual cell classes within these subdivisions, increasing the need for extensive information on neurocytological features. In order to more fully describe the transformations of sound stimuli performed in the auditory centers, it is helpful to correlate the ultrastructural and chemical phenotypes of the neurons, especially those related to synapses, and the molecules involved in neurotransmission. Immunocytochemical methods have proven invaluable in this respect, because they afford the localization of special molecules not only at the regional level, as obtained with biochemical micromethods, but also at the cellular and subcellular levels.